OMAHA (DTN) — A newly formed energy company based in Warrenville, Illinois, outbid Shell Oil Company on a Hugoton, Kansas, cellulosic ethanol plant previously operated by Abengoa Bioenergy, according to court documents. The bid was for $48.5 million. The winning bidder, Synata Bio, Inc., now owns cellulosic ethanol technology formerly owned by Coskata Inc. Coskata was primarily involved in technologies that allow for the production of cellulosic ethanol from natural gas. Back in October, Shell agreed to be the stalking-horse bidder for the plant that produces cellulosic ethanol from wheat straw, switchgrass and other biomass. The stalking-horse bidder essentially sets a floor price for an auction. That bid was set at $26 million. Synata outbid Shell by nearly $8 million, according to court records. Shell had made a bid of about $40.8 million. Though Synata was the highest successful bidder for the plant, which is estimated to have cost about $400 million to build, court records from the U.S. Bankruptcy Court for the District of Kansas show Shell remains the backup bid if there were any issues with the Synata bid. Closing on the sale is set for Dec. 8. According to patentbuddy.com, Synata has 52 patents in force and 21 pending with the U.S. Patent and Trademark Office. Back in 2012, Coskata had announced it was making an initial public offering to raise about $100 million. Coskata, which was backed by venture capitalist Vinod Khosla, withdrew the IPO one year later, citing market conditions for the decision. In 2010, Coskata was named as one of the top 50 innovative companies by Technology Review, the journal of the Massachusetts Institute of Technology, or MIT. Coskata had partnered with General Motors back in 2008 to use the cellulosic ethanol technology. The Coskata technology reemerged in 2015 under the Synata name. 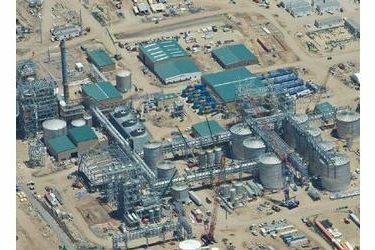 The Hugoton plant is the last of Abengoa’s ethanol assets in the U.S. to be sold as part of a bankruptcy reorganization. In August, Abengoa sold three of its ethanol plants to Omaha-based Green Plains Inc. during an auction. Green Plains bid $237 million to purchase plants in Madison, Illinois; Mount Vernon, Indiana; and York, Nebraska. The plants have an annual combined production capacity of 236 million gallons. KE Holdings LLC made a successful $115 million bid to buy the Abengoa plant in Ravenna, Nebraska, while Kansas-based ethanol plant builder ICM Inc. was the high bidder at $3.15 million for the Abengoa plant in Colwich, Kansas. ACE Ethanol, LLC, was the successful back-up bidder on the Kansas plant, with a bid of $3 million. The Abengoa corn ethanol plant in Portales, New Mexico, was sold to Natural Chem Group LLC at auction in the U.S. Bankruptcy Court for Eastern District of Missouri. Natural Chem announced plans to convert the plant to biodiesel production. The 25-million-gallon Hugoton plant has been in “cold status” for some time. The plant was in the middle of start-up when Abengoa’s financial problems surfaced. The Hugoton plant is designed to use a variety of feedstocks, including wheat straw, switchgrass and even municipal solid waste. It was expected to provide an annual $17 million, 300-million-ton feedstock market for area farmers. The plant is designed to process about 1,000 tons a day of corn stover, wheat straw, milo stubble, switchgrass and other biomass feedstocks, all within a 50-mile range of the plant. The plant also is designed to produce electricity.